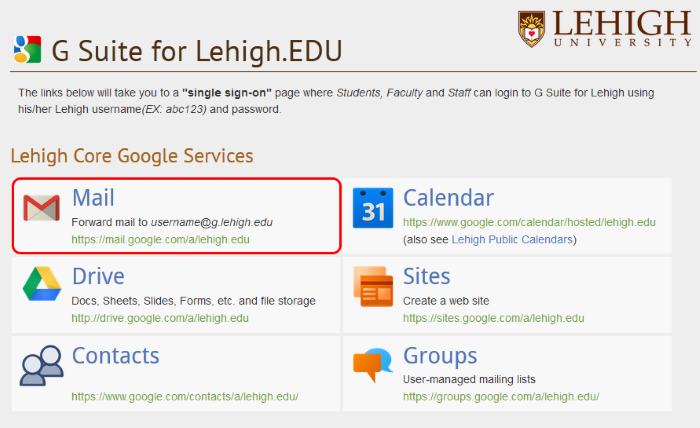 Some retirees / spouses may wish to copy their Address Book, including Lists (also called groups) from Thunderbird to Lehigh Gmail. Below are instructions for exporting addresses from Thunderbird and then importing them into Gmail. You may wish to have a friend, family member, or local tech support person assist you with this task. Open Mozilla Thunderbird. Note: Steps for Seamonkey may differ from Thunderbird, but the process will be the same. From the Tools menu, click on Address Book. A new window will open showing you the contents of the Address Book. You should see Personal Address Book and Collected Addresses, in the column on the left. A small window will open asking where you’d like to save the file, what name you’d like to give it, and what file type it should be saved as. Choose the Desktop folder to save in. IMPORTANT Below the name, make sure Type is set to CSV (Comma Separated Values). Log into Gmail and then click on the red Mail link in the upper-left corner. 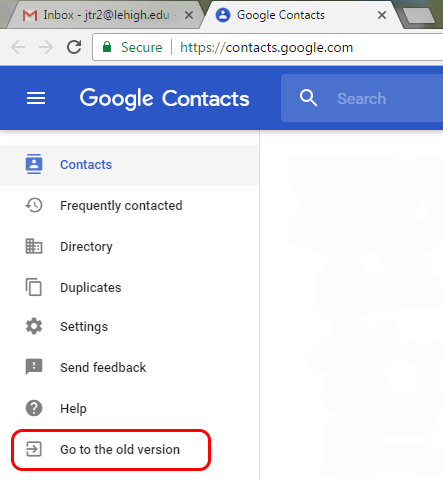 In the menu that appears, click on Contacts. After the page refreshes you should see the option to “Import Contacts” as the second-to-last link on the left. Click it. In the window that appears, click the “Choose File” button. Navigate to your Desktop and double-click the “contacts.csv” file. Now click the blue “Import” button, and be ready to wait a few seconds to a couple minutes. 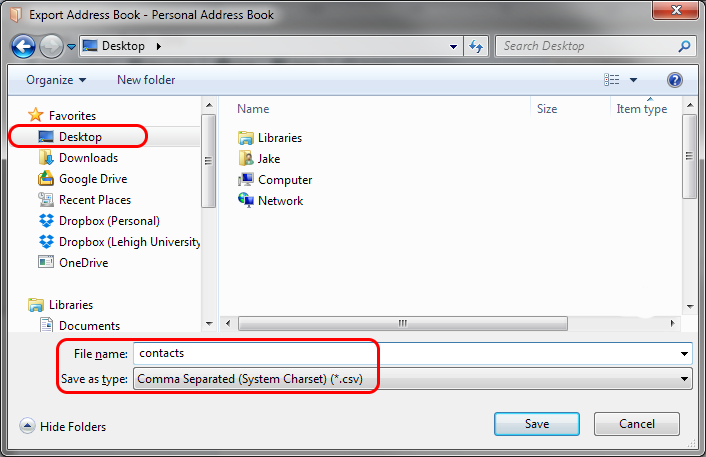 If your contacts fail to appear after a few minutes, the CSV file may have contained bad data. Examine the file using Excel or Google Sheets and remove any lines containing special characters or non-address data. Save the file and try importing again. After a successful import, you should see a new group called “Imported -Date-of-Import-” under My Contacts. 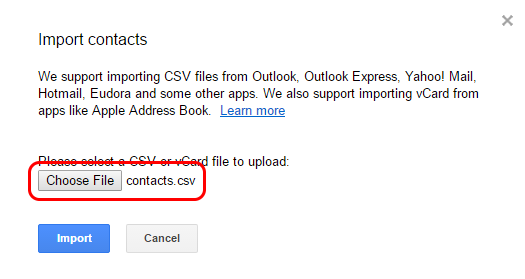 Repeat the process of Importing each csv file into Gmail Contacts. 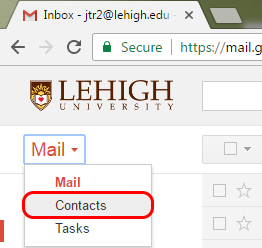 You can now close the Contacts tab and return to Mail. When composing a new email message, you should be able to begin typing any person’s name or email address from your Contacts and have their address auto-complete in the TO: field. Note that all Lehigh faculty, staff, and students are automatically included in this auto-complete, but retirees and alumni are not.